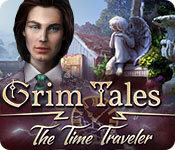 Grim Tales: The Time Traveler is rated 3.4 out of 5 by 9. Rated 4 out of 5 by JulzCat from The Family Just Keeps Growing! Another member has been added to this increasingly large family and he's causing trouble! 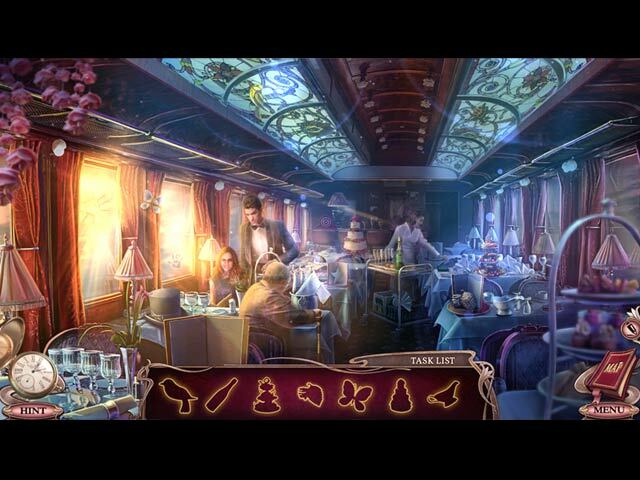 I'm not 100% clear on the story because unfortunately, hidden object games no longer seem to come with diaries (I miss that). I like the new skull daddy with a less-annoying voice, but his presence seems to be less and less warranted. I would like to see Aunt Gray go on some adventures of her own without having to constantly save her relatives. This game was shorter than I prefer, but honestly, the graphics on these games are so breathtaking I barely care if the game play is up to snuff. Rated 4 out of 5 by ninja226 from Loved the game, except for the ending The production value for this game is excellent. The artwork is so well done and fun to wander among a well appointed manor. I played this game on Expert mode, which disables Hint, Skip, sparks and helpful messages, but managed just fine for 99% of the game. The puzzles are easy or manageable. HOPs mostly consist of finding pairs of objects hidden behind other items, ie pretty straightforward. In the previous games in this series the ghost helper spoke so slow, I fell asleep. But in this game he talks at a normal pace, which is soooo much better. I really enjoyed this game, but the ending, while happy, is too abrupt and not satisfying. Nevertheless, a game with nice eye candy. Rated 4 out of 5 by deddu from Time to End I agree that the graphics are excellent, the hidden objects are pretty standard and the puzzles are fine. However, although I have played all in this series, I am getting a little tired of Dad. I think it is time for him to go. Also, I thought the game ended abruptly. Rated 3 out of 5 by iou001 from Back and forth This game isn't bad but it's not great either. I clicked on the 'Hint' button more than I did hidden objects. And it takes you back and forth and back and forth. The graphics are amazing compared to other games I've played. Dad showing up (again and again) got boring. Thank goodness for the skip button and fast recharging 'Hint' buttons I got past the boring parts quick. I skipped a lot of the mini puzzles because they were too challenging for my relaxed brain to stress over. I still enjoyed the game and will recommend it to my friends. Rated 3 out of 5 by peacelilly47 from big disappointment!! Ok..so had to buy it, have played all the others. Always love this series. Richard's voice was different which irritated me. not his usual sarcasm. Knocked this off in no time. Way to short. We'll see if abrupt ending has follow-up. Rated 3 out of 5 by pennmom36 from BONUS CHAPTER APPEARS TO BE THE BEST PART OF THE GAME, BUT.... Out of all the developer's, I personally love the type of graphics Elephant Games offers. Unfortunately, it's a hit or miss when it comes to the storyline's on some of their series games. I've always enjoyed the Grim Tales series, but after playing The Time Traveler, I have to admit that this is my least favorite out of the series. The Time Traveler is a very short game, with only 3 Chapters (plus Bonus Chapter in the CE) and the chapters themselves aren't even very long, the SG shows about 6-8 pages per chapter. The first chapter is decent, the second chapter was downright boring, but the third chapter picked back up slightly. The Bonus Chapter, however, started out with an interesting plot, all I can really say is that you and your husband Dorian have discovered that nephew Mike is missing (any more info will ruin the main game's plot) I barely got to play the BC, because I encountered an access violation and the game was terminated, so I'm not sure what that's all about yet, but it looked to be the best plot of the entire game! My favorite feature offered in a HOPA game, is Morphing Objects, and Grim Tales always offers Morphing Objects (thank you Elephant Games for always including Morphs in your games!) So my personal preference is the Collector's Edition version, but here's a recap of my review to help you decide which version, if either is right for you: Move over Anna, there's a new Time Traveler in Town, and he's seeking revenge on everyone, well at least the Gray and McGray family members. Anna Gray and her dear ole dad, Richard, were heading to the new McGray mansion, for a family barbecue with James and Elizabeth, when Anna is forced to swerve off the road to avoid hitting a stranger. (I wonder if Anna straps the seat belt over Richard's skull?) After hoofing it to the mansion, Anna discovers a horrifying, grizzly sight, so once again, Anna must perform the sacred family ritual, that allows her to travel back in time, where hopefully, she'll be able to stop a mysterious Time Traveler from destroying her entire family! I've always been a fan of the Grim Tales series, and I've always loved the realistic graphics that Elephant Games brings to the table. Lately, the Collector's Edition goodies have been diminishing little by little, from some of the devs, but not from this pachyderm proboscidea! Each scene in the Collector's Edition version of The Time Traveler, has a Morphing Object (yea! my favorite CE feature) and some of the scenes have collectible Puzzle Pieces to assemble a Screensaver, as well as collectible Gray & McGray family Statues, that give brief descriptions of who's who to whom. Every time I play a new Grim Tales, I'm always left with more questions than answers, it seems. As I rummage through my (aka Anna) family photos, one is labeled Anna, Elizabeth McGray and her two sons. I have to label my own name on the photo, yet I can't label the kids names, they are just Elizabeth's two sons? Then when I arrive at the mansion, I immediately say "oh I'm too late" am I psychic as well? Shortly thereafter, I see that the Red Wine has been Cosbeyed (think about it) which turns the red wine to green. Unless I just polished off an entire bottle of wine, wouldn't I notice my red wine was now green? I pick up a threatening memo left behind by the perp, know how I know it's from the perp? Cause he signed it....a demon from the past. Once I finally make my way inside the mansion, I discover cobwebs in every nook and cranny. They can afford a mansion, but not a maid? The mansion comes with a beautiful pond, stocked with blacktipped sharks? In the backyard, is a fireplace with a pot of boiling water. Okay, after all they were having a picnic, but no matter how many times I return, it never boils and evaporates, again okay. But the real question is, if time supposedly stands still, if everyone is "frozen" in place, and Anna is the only one that can move, why is the water boiling? The good news is that I use the same screwdriver FOUR times just in the demo! (can't say the same for the net, which is discarded immediately, only to discover the next scene requires something similar) Later on, I come across a spiders web that I simply cannot brush away with my bare hands, but I'm totally down for picking up the wild mouse that's living in the baseboards, right next to the yucky spidersweb? 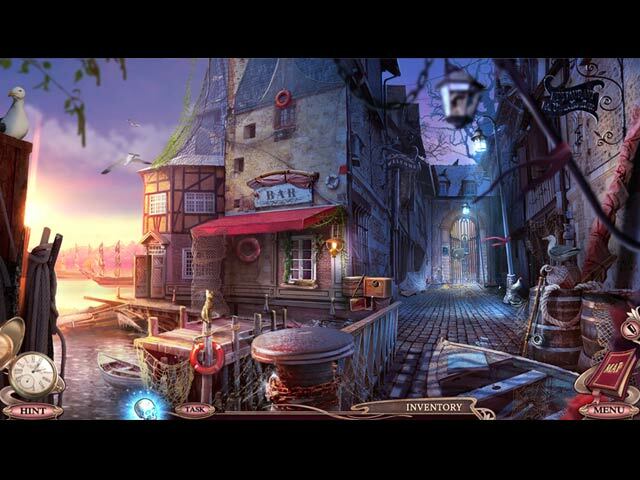 [end confusion] The Hidden Objects vary, and are nicely done, but there are no alternative games available if you're not into HOP's. There are Interactive List finds, Silhouetted Shape finds and Pair finds where you move two objects at a time to find matches. There are also smaller Zoom Zone HOP's with just a handful of Silhouetted Shape objects to find. The Mini Games are good, although nothing really new is presented. Most are easy to medium difficulty. Below are brief descriptions of some of the games you'll encounter during the demo: 1) Swap triangles to complete the pattern, swapping vertically will rotate triangles. 2) Rotate inner and outer circles to restore the pattern. 3) Swap lock parts to match the carved dowels. 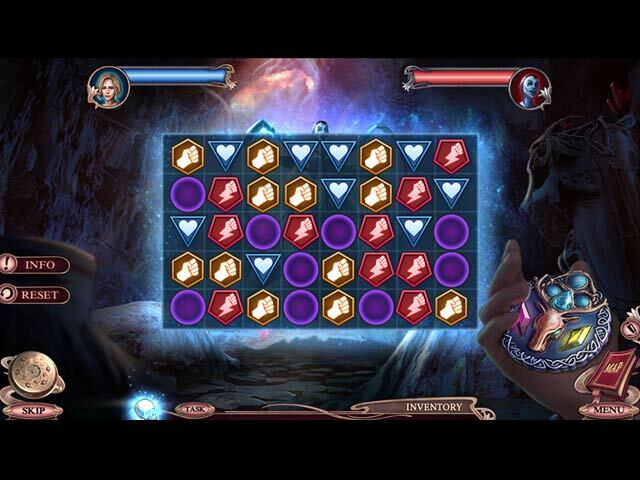 4) Arrange the fish so they will fit into their matching slots when the you press the play button. 5) Swap the footprint tokens to match their animal counterparts. 6) Swap colored elements that create connections until all connections have been closed. 7) Guide the gold golf ball to make a hole-in-one, by moving the red balls against the gates to create a path (repeat x2) 8) Turn the dial to input the correct code according to the clue. GRIM TALES GAMES AVAILABLE Title***Collector's Edition Release Date***Average Rating 1- The Bride (August 4-2011) 3.8 2- The Legacy (January 5-2012) 4.6 3- The Wishes (July 12-2012) 4.5 4 -The Stone Queen (January 3-2013) 3.9 5 -Bloody Mary (August 1-2013) 4.3 6 -The Vengeance (May 15-2014) 4.5 7 -Color of Fright (November 6-2014) 3.8 8 -The Final Suspect (May 16-2015) 3.9 9 -Threads of Destiny (October 7-2015) 3.9 10 -The Heir (February 25-2016) 4.3 11 -Crimson Hollow (August 25-2016) 4.1 12 -Graywitch (February 2-2017) 4.0 13 -The White Lady (August 3-2017) 4.0 14-The Time Traveler (January 25-2017) 3.5 by: Elephant Games The Collector's Edition version has 8 Wallpapers, 8 Concept Art pictures, 5 Music Soundtracks, Archives, 14 Collectible Family Statues, Morphing Objects in each scene, 18 Achievements to earn, 26 hidden Puzzle Pieces to assemble a Screensaver, a built in Strategy Guide and a Bonus Chapter, enjoy! Rated 3 out of 5 by PATinPNS from Speaking of Time, Maybe it's Time for this to End This is posted after playing the entire game. This one could signal the end of this great series. I have enjoyed all of them, but this one left me lacking in so many ways. Graphics were well done. Music was okay, but where I had a problem was with Richard. I couldn't understand and thing he said. If not for the dialog box, it would have forever been lost. The other voice overs were fine, but why they distorted Richard so badly I will never understand. Effects went along with the action in the scene and was well done. Hidden objects were good. Mostly lists, but some silhouettes and pair matching broke it up. Now, the mini games.. they were horrible. I was able to do one or two, but they were either so complex I couldn't understand or so involved I lost interest in trying. I'm not known for my patience and these wore me down quickly. I was to glad I used the custom setting and had my hint and skip at the quickest possible setting. The map was essential for me. There is a lot of back and forth with little to help me decide where to go. The map showed places where I had something to do and would transport. A huge help. Others will go into the story in depth, so I'll not bore you with the details. The story was pretty predictable with little change from previous games. They changed Richard from his evil self to a comedian of sorts. That just burst my mental bubble of him. Richard is one I loved to hate, but this time, he was just there occasionally. Not much added to the story at all in my opinion. Play the demo and see what you think. It's not a bad game. Just one I expected more. Rated 2 out of 5 by Granny_Gruff from I Vote We Lay Daddy's Skull to Rest Along With Both Families! Anna is back with Daddy's skull in time to attend a family BBQ and run her car off the road. In this newest, and again lamentable, addition to the Grim Tales series, another time traveler is out to kill off the Gray and McGray family members, including Anna. Luckily she survives his first attempt and arrives at the McGray home in time to see the police packing up evidence of two murders. As Daddy's ghost so cleverly puts it: it’s time to investigate. Good stuff: All the usual game elements are present. Bad stuff: Everything is locked up beyond crazy! You find two pieces of canvas torn from a portrait in the front hall, presumably by the bad guy. One is hanging from the doorknob of the room he's locked himself into upstairs. The other piece is outside a window that is screwed down. Once restored to the canvas, the picture slides aside to reveal a safe. This safe in the front hall has its combination engraved on the side of a locked cubicle inside a locked door off the front patio area. When you open the safe you get a lot of junk and one item to use. That pretty much is what happens everywhere around the mansion. Multiple amulets and locks are used to keep junk and garbage safe. Anything that should actually be secured is not. Example: The police are packing up evidence of two murders into a box with two amulets and a puzzle in the top to open it. The amulets are left lying around - the bad guy actually had one - and the other police box has its amulet dumped in a drain in the front walk. Do we all feel protected by these bozos? As usual there are more logic fractures, lots more, but it’s the only fun you'll find in this demo, so I'll leave you to it. This series has more than run its course. The least trite moment I can point to is when you come across some bees, flying around at night, you do not reach for the usual smoker. You just hunt up a can of insecticide. Sorry, bees. Please try the demo. It will take little of your time and you really need to see what you are buying.